Description: I created a webpage to showcase a logo I created for a company. Process (Programs, Tools, Skills): I started this project with an html file. Using TextWrangler, I added a correct title, edited the content of the list and headers, added a footer and hr break line, and a div section to group the body together. I inserted my correctly sized PNG logo file. I also added code in to connect the code to a CSS style page. In the pre-formatted CSS page I changed the size, color, and padding of most of the items. The colors that I used came from my logo design. To do this, I opened my logo in Adobe Photoshop and used the color picker tool to find the hex code for each of the colors. Then I could change the original colors that were in the file. Then I changed the fonts and made sure to add several options, which helps with the multitude of differing browser and font libraries people have access to. In addition, I worked with the hr break line and the image to make sure they worked nicely together. I stylized the div, hr, and footer section. I made sure to both a CSS validator and an HTML validator. Doing this actually helped me to catch a mistake I had made, even though the browser did not show it when running the page. 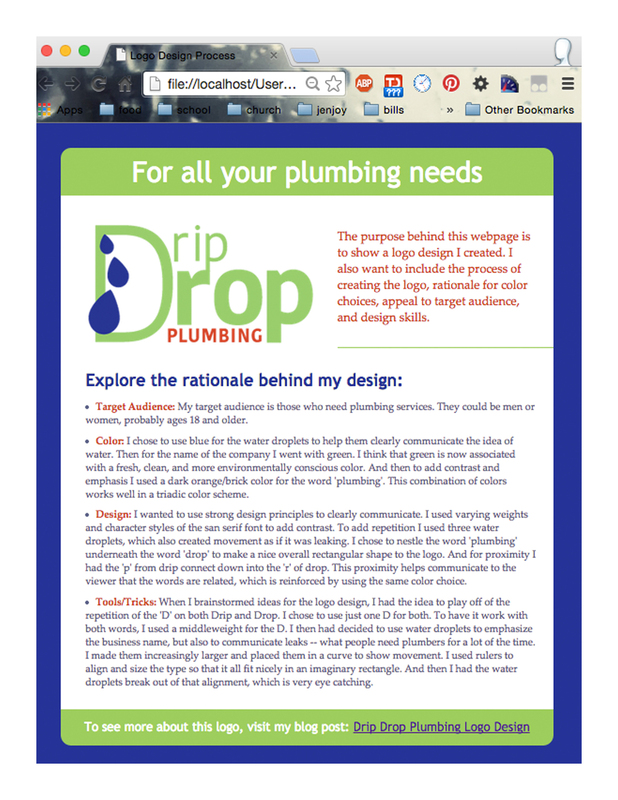 Message: My goal was to create a logo for the plumbing company, Drip Drop Plumbing. The fix all sorts of plumbing issues. Audience: Any person who is needing a good plumber to help them. Top Thing Learned: I learned how to stylize an html page using CSS. Doing this helped me to see the importance of using specific and correct semantics in html that make this process easier and help communicate your idea more clearly. Changes made to the CSS: I changed the header color and size, the background color, the body and list size and color, I changed the padding around all the objects, I added a footer and edited the type and link within, I also added and stylized a break line, and I deleted the border around the body. Nice web page. I like how you added a paragraph next to the logo. I also like how you put the link to your blog in the footer and made the footer match the header. Your logo is prominent in your webpage and caught my eye first. The red bolded words infront of your paragraphs also caught my attention. I think everything comes together nicely. I like how you applied the color scheme of your logo to the rest of the web page. The fonts contrast nicely. The logo makes an effective focal point. I especially like the red subtitles as they create good contrast and repetition.